Protesters gathered outside of the National Fuel headquarters in Amherst Saturday to protest the Northern Access Pipeline. 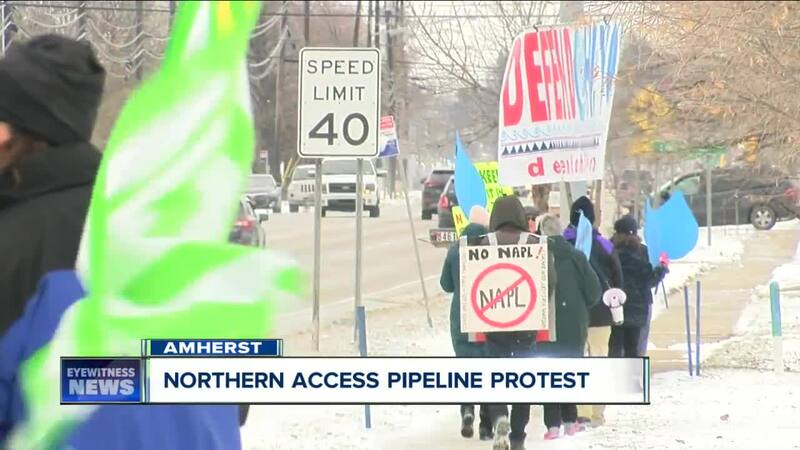 AMHERST, N.Y. (WKBW) — For almost four years National Fuel and environmentalists have been going back and forth over the proposed Northern Access Pipeline. That continued Saturday, as dozens of protestors met outside of National Fuel's headquarters in Amherst. The proposed pipeline would connect fracking fields in Pennsylvania to existing pipelines in northern Erie county. Previously, the New York Department of Environmental Conservation denied National Fuel’s plans to build the pipeline, in order to protect Western New York waterways. But in 2018 a federal agency overturned the state's ruling. “As to the protest: We believe that the pipeline review process has addressed all of the questions and concerns that are continually discussed with regard to the Northern Access Project. Thousands of pages of research, due diligence and responses have been provided and have been open to public reviews. We have hosted numerous public meetings, since 2015, to give fact-based information to the community and answer questions. It is important to acknowledge that there are currently four interstate pipelines that cross Cattaraugus Creek that National Fuel operates safely without incident. As well, National Fuel as signed more than 500 landowner agreements for easements along the 97-mile proposed route. We do not take this land from its owners. We pay for easement agreement that allow the landowners to continue to use it for recreational purposes and/or farming. The only thing that can’t be done on that land is build a structure. The Northern Access Project- a $500 million investment - will support new and growing employment at National Fuel, in addition to good-paying local jobs within the building trades during construction, and is estimated to increase property tax receipts by $11.8 million for four N.Y. counties (Erie, Niagara, Cattaraugus and Allegany). Twelve school districts within those counties will benefit from an annual incremental increase in tax revenue. This project is designed to transport domestically-produced natural gas to the North American Pipeline Grid providing access to a low-cost energy source for residential and commercial customers across the Northeast.